These days I’ve looked at the tweets of Scott Ullrich and what catch my attention is the mentioning of pfCenter several times. 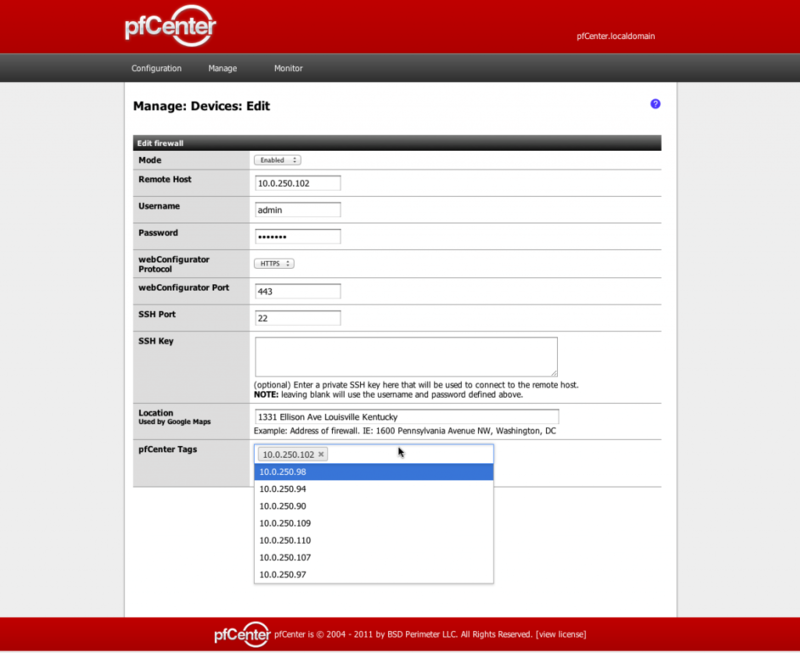 pfCenter is the product we are working on to allow administration of multiple pfSense boxen from one GUI / Appliance. pfCenter now supports tags! Later this summer we will change how large scale deployments of pfSense are managed. After I have took a look at the shred screen shots from his image gallery. My suspicion is that this center will perform tasks similar to Astaro Command Center. There will be a Real-Time Monitoring, Site-to-Site VPN configuration for multiple sites made quick and easy. We can hope for centralisation of Device Maintenance tasks such as firmware upgrades and configurations propagation, some kind of Inventory Management component that can show us what, where and in what state we have. Access Management so you must know only one set of credentials to manage all hooked up devices. I really do hope that there will be some form of Aggregated Reporting functionality, RRD is great for some purposes, but alone is not enough and NTOP is great but a dedicated appliance is better suited for it alone. The next logical question is where you would you place such thing? On a pfSense box, might be, but a dedicate Appliance sounds more reasonable, taking into account the amount of data and load, that such a solution could generate. As alternative a Virtual Appliance sounds as a good idea. Last but not least as an option is a service in the cloud, a hosted multi-tenant installation of the pfCenter. Which of these alternatives will be the one we’ll see? The source of these images is Scott Ullrich twitpic gallery. 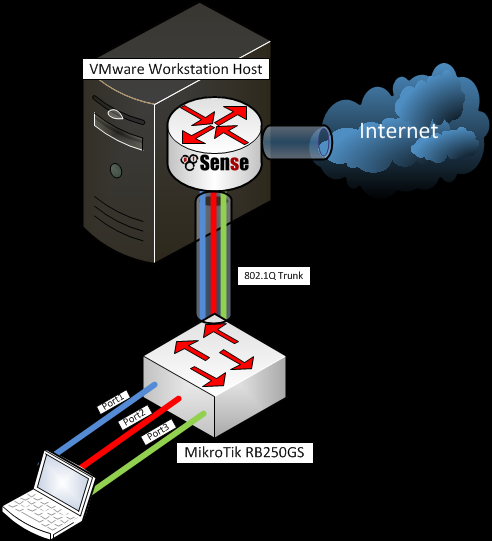 In my previous posts we’ve Install pfSense 2.0 RC1 on VMWare Workstation 7 and adjusted the memory of the Virtual Machines in pfSense 2.0 RC1 on VMware Workstation 7.1.4 – RAM size. 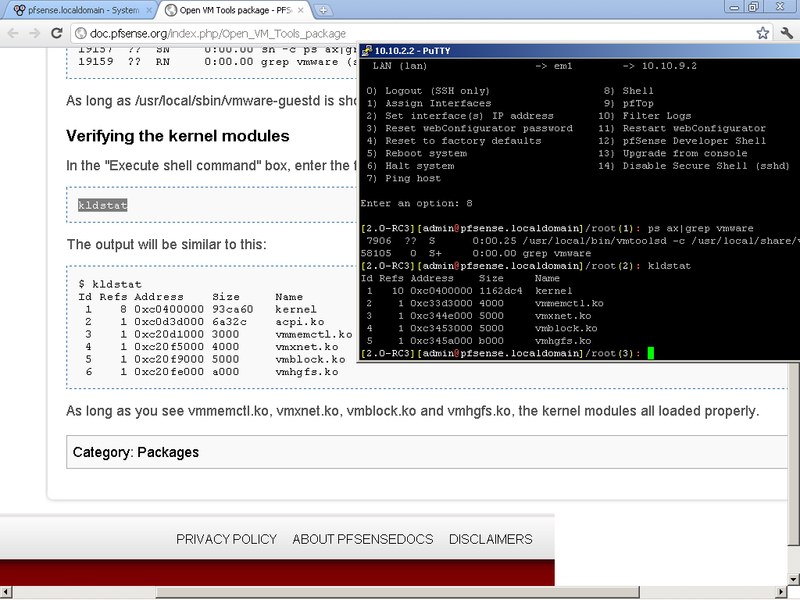 Now let’s continue with the setup of the Virtual Machine with the installation of VMware Tools for pfSense. 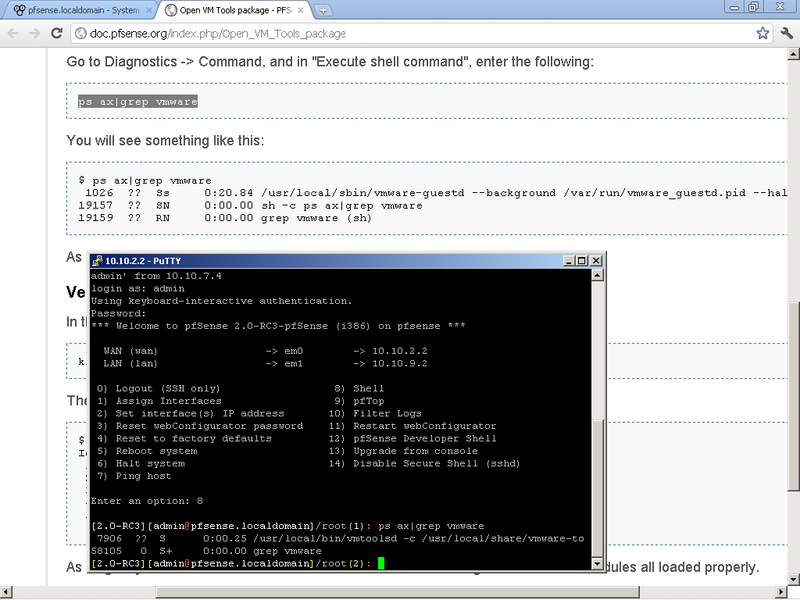 , and on the Available Packages find Open-VM-Tools. Click on the “+” next to it and start the installation. Wait it to finish, and on the Installed packages you should see it listed. Click on the link below Package Info, to see the instructions how to verify successful installation. The operation boils down to connecting to the console and executing first and monitor the output. 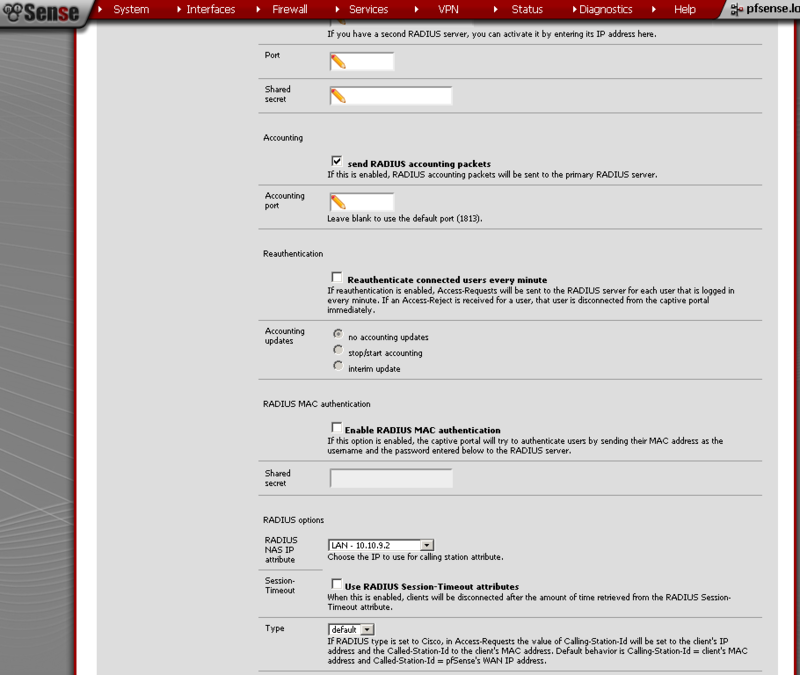 Upgrade pfSense 2.0 from RC1 to RC3. 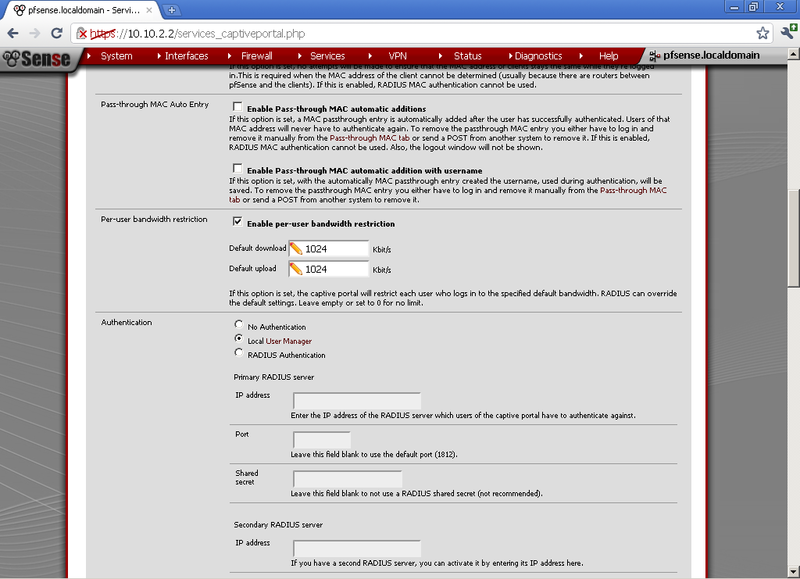 In this post we will upgrade pfSense 2.0 from RC1 to RC3. Now go to System > Firmware and click on Enable Firmware uploads. Click on Choose File button, select the file that we just downloaded, and click on Upgrade Firmware button. Wait for the firmware upgrade process complete. That’s it. If you want more graphical representation, I’ve just uploaded a video here with the whole process. After we have setup Captive Portal and customized the pages in the previous posts. Now let’s wrap it up with the other two authentication methods. In this article we are going to configure RADIUS authentication for users, and create Vouchers for our Guests. 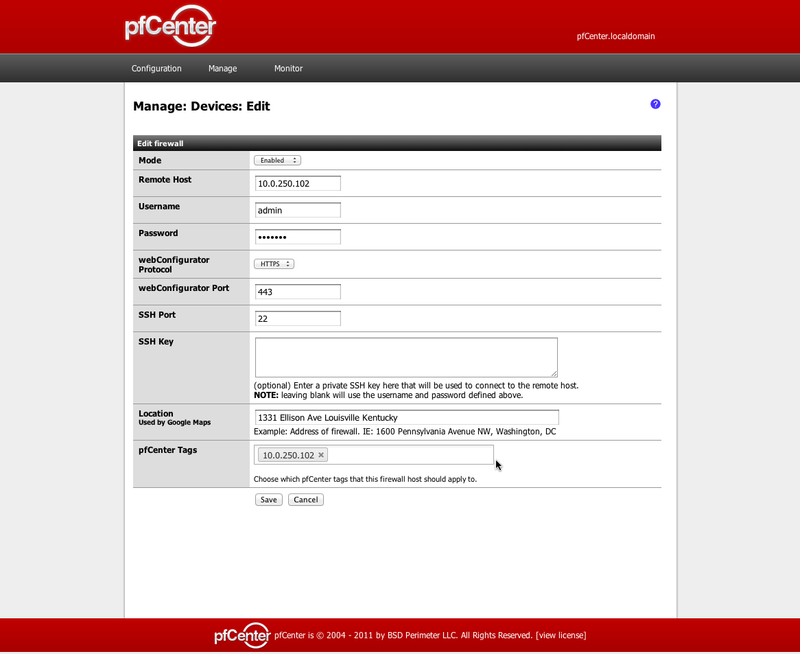 In the previous post pfSense 2.0 RC1 – Configure Captive Portal for Guests, we used Local User Manager for authentication. But managing users in multiple systems can be dull task. For that reason we could provide our Users with a way to use their Active Directory user accounts to authenticate against the Captive Portal. For our Guest We can create one Guest user account in Active Directory, but a better solution would be to provide them with one time use Voucher, that can be dispose of at the end of day. The only change from our previous setup is the use of one Windows Server 2008 R2, with Active Directory Domain Services and Network Policy Server roles. We can reuse the setup of NPS from OpenVPN with RADIUS authentication on pfSense 2.0 RC1, up until the pfSense configuration. So I would not duplicate the steps here. On the Captive Portal leaf, scroll down to the Authentication Section. Optionally if you wish tick the send RADIUS accounting packets check box. 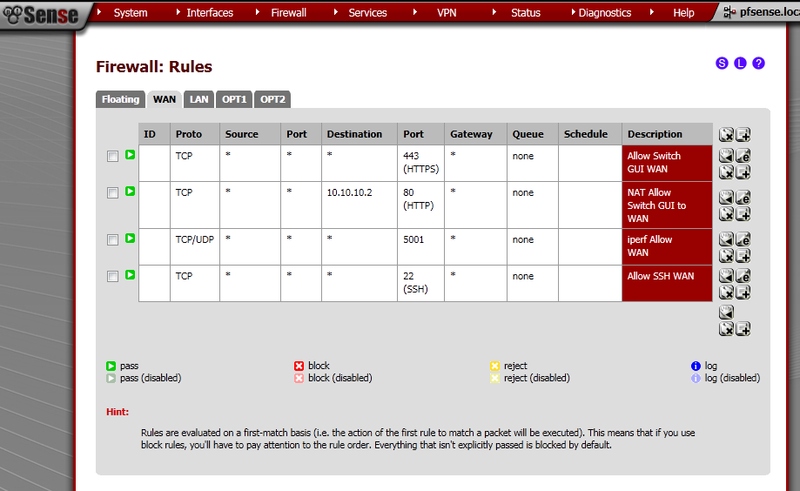 And under RADIUS options, RADIUS NAS IP Attribute, select the LAN interface. I presume that behind this interface is your RADIUS server. The first time you Enable the Vouchers, a pair of RSA keys are generated for you automatically. The pre generated RAS keys are 32 bits. For now we will use the default. But if you want to create 64 bit keys, you can check our the article Captive Portal Vouchers. For the Save Interval, the default value is 5 minutes, but I do not want the state of the vouchers to be kept in my configuration file, so I’ll change it to 0. Leave the rest of the fields to default values. Save the configuration. No let’s generate some vouchers, in the Voucher Rolls section, click on the “+” sign. 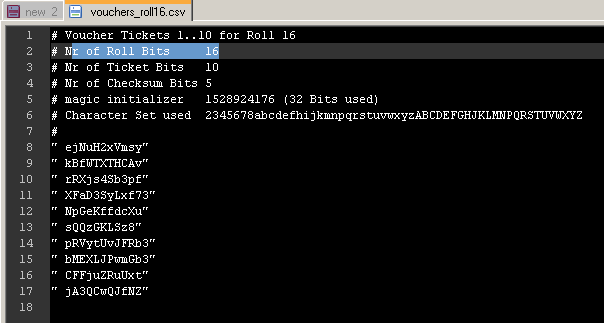 Roll# – 16, Minutes per Ticker – 460 (8 hours), Count – 10 this is the number of vouchers generated. You can put some comment for reference. Save it. Upon return to the Vouchers leaf, click on the circle with “i” in it to export the list of vouchers. 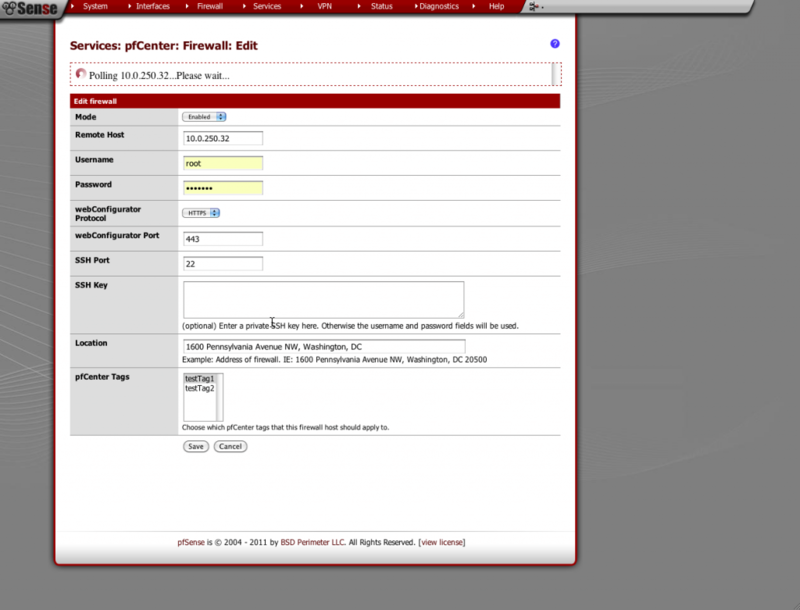 Open a browser on a computer connected to the Guest interface of pfSense, enter a web address, and you should be presented with the Captive Portal page. For RADIUS test , enter a user name and password, from the Active Directory, and you should successfuly log in. For test of the Voucher system, copy one of the rows from the csv file, and paste it in the Voucher field. The web address that you typed should load, and you will have access for the next 8 hours. On the web GUI, you could check that the user is successfuly connected. m0n0wall documentation of the Captive Portal, can be used for cross references. 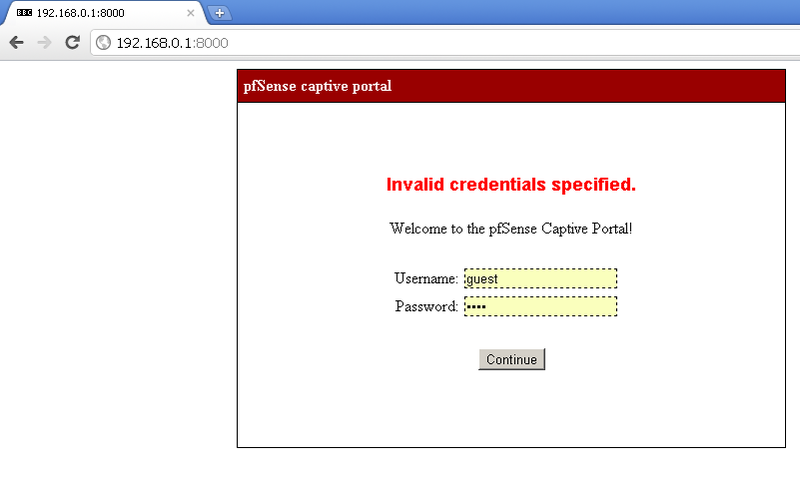 During the last three posts we look at the basic configuration of Captive Portal in pfSense 2.0 RC1. Also we customized the Portal pages, and used different authentication methods available. 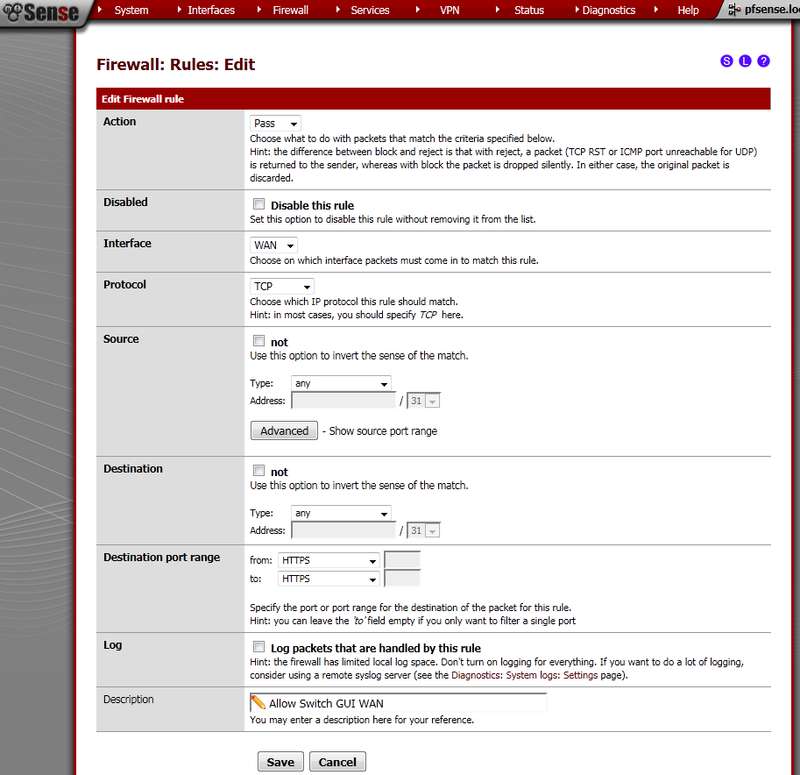 Using this feature of pfSense you can safely provide Internet access to your users and guests. Of course there are many other options that we have not covered, but they are left for future posts. Thank you for reading, and I hope it was helpful. 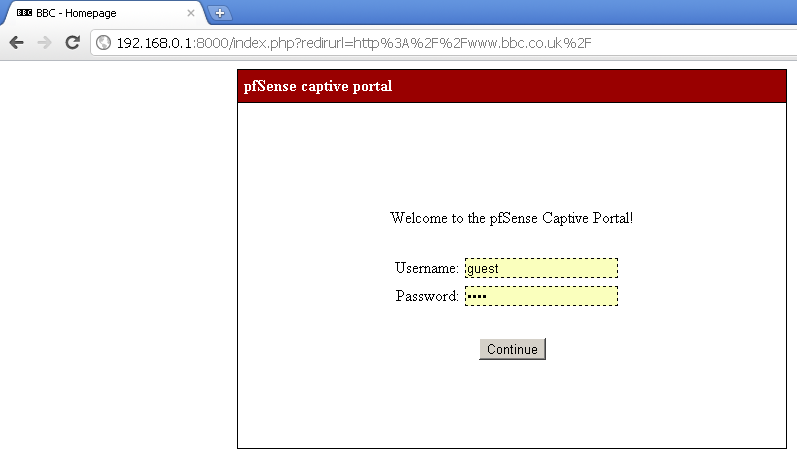 In the previous post pfSense 2.0 RC1 Configure Captive Portal for Guests with Local User Management we configured a basic Captive Portal. Now I want to customize a little the web pages that are presented to the guests. Users will send credentials, and it is better to use HTTPS, that’s why will will configure it too. 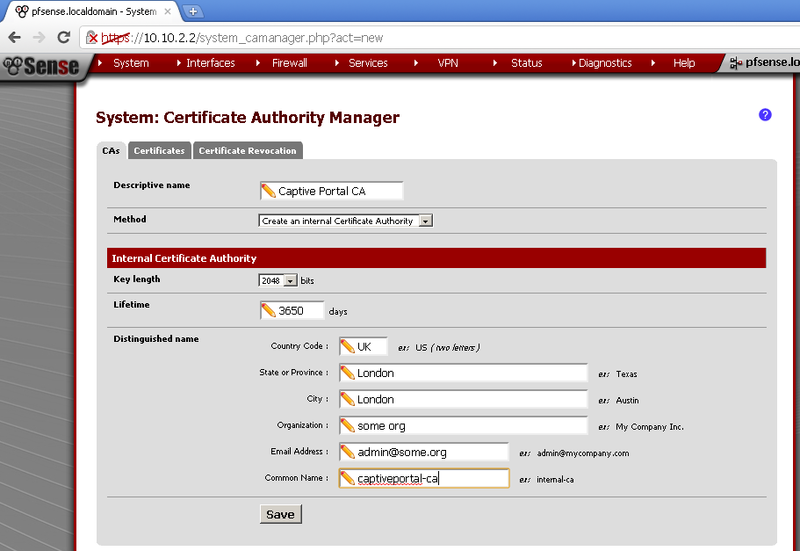 On the CAs leaf, select Create and internal Certificate Authority. Fill in the form to your likings. Make note of the Common name and the Descriptive name. 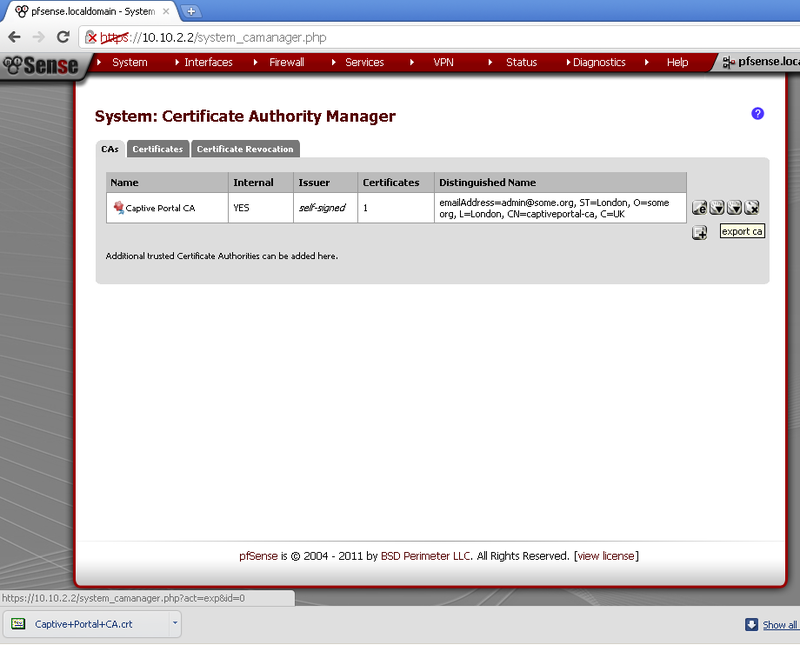 Go to the Certificates leaf, and Create an internal Certificate, fill in the form. 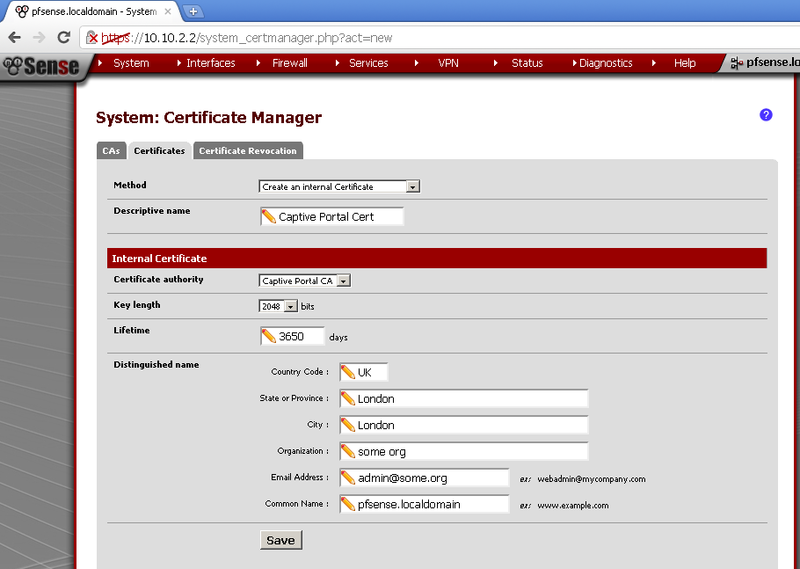 The Common Name for the certificate must match to firewall name. In my case it is pfSense.localdomain. Also note the Descriptive name of the certificate. On the CAs leaf click on the downward pointing triangle with rollover info export ca. 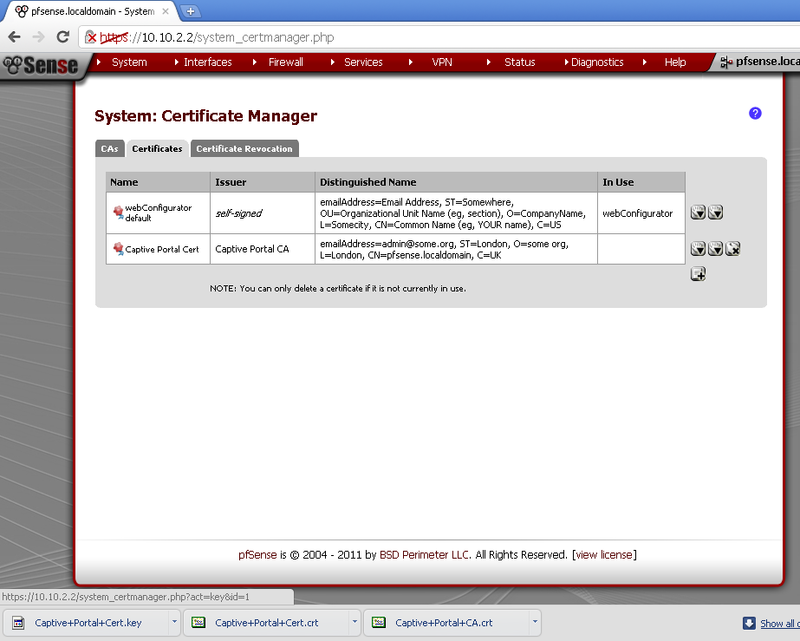 On the Certificate leaf, click on both downward pointing triangles for the Captivate Portal Cert. 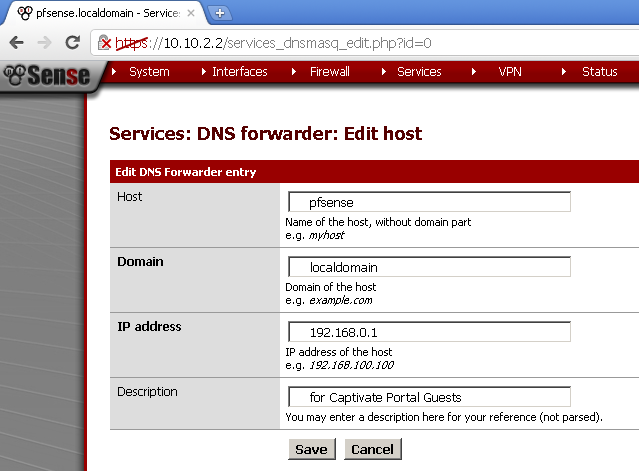 Enter Host, Domain, IP Address and Description. In my case the host is pfSense, the domain is localdomain, the IP address is the IP used by pfSense for the Guest network and I’ve entered some useful description. Now open the certificates in your favourite text editor. I’ve used Notepad++, and copy and paste the content in the Services > Captive Portal pages. Go to the File manager leaf of the Captive portal. Click on the + sign. And choose your logo image. Then click on the Upload button. Take a note of the name of the image, if it is different from the one used in your pages update them before uploading. Go back to the Captive portal leaf, and scroll down to the Portal page contents section. Click on Choose File button and select your page file. Do the same for the Authentication error page contents page with the index_error.html page. Save your configuration. I’ve used the build in Certificate Manager, because it works for me. The alternative is to use OpenSSL as explained in the pfSense forums. This is closely related to the DNS record. By customizing the pages we can brand them and in the same time create more enterprise look and feel. Opening the voucher field is first step to my next post. There the main topic will be configuration of vouchers and RADIUS authentication. 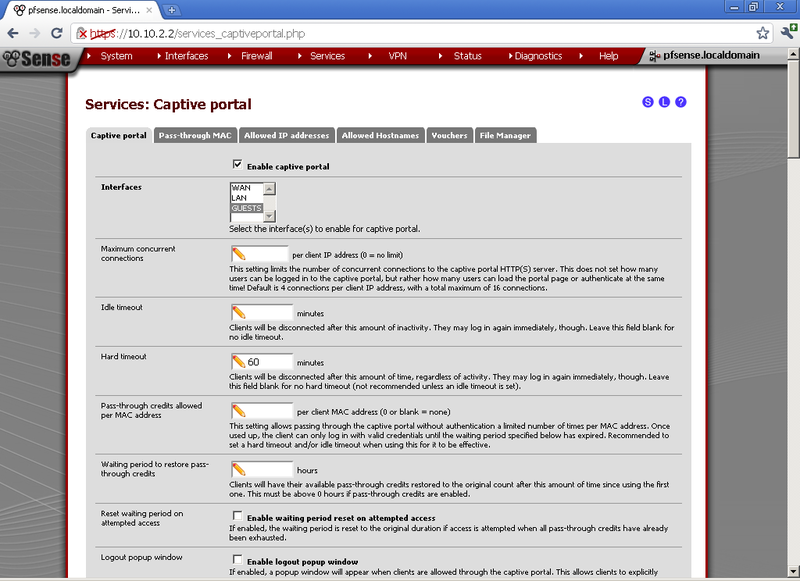 adds the Acceptable Use Policy, I’ve borrowed this from How To: Using m0n0wall to create a Wireless Captive Portal – Step 4: Create the Captive Portal Page. example, and with a little help from a friend integrated in to this form. 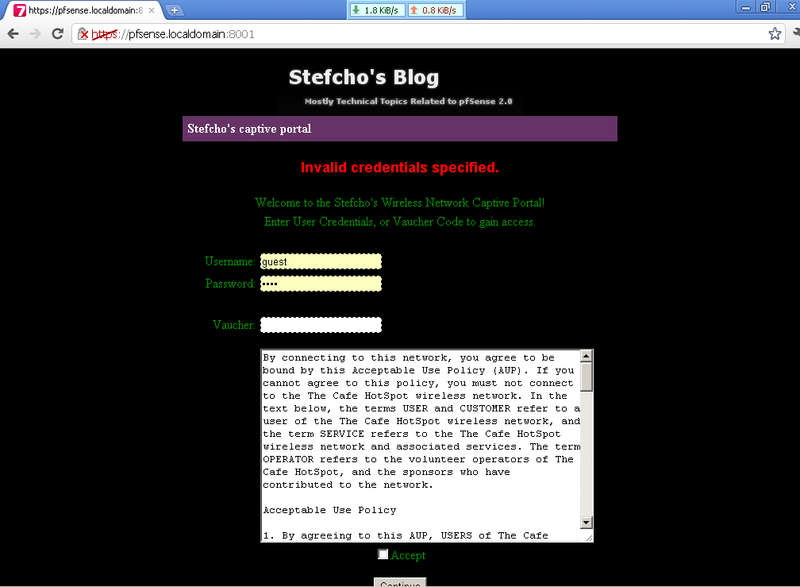 Welcome to the Stefcho’s Wireless Network Captive Portal! Enter User Credentials, or Voucher Code to gain access. Index_error.html – The only change here is the addition of “Invalid credentials specified.”. I did not add the “$PORTAL_MESSAGE$”, because it is for RADIUS only. 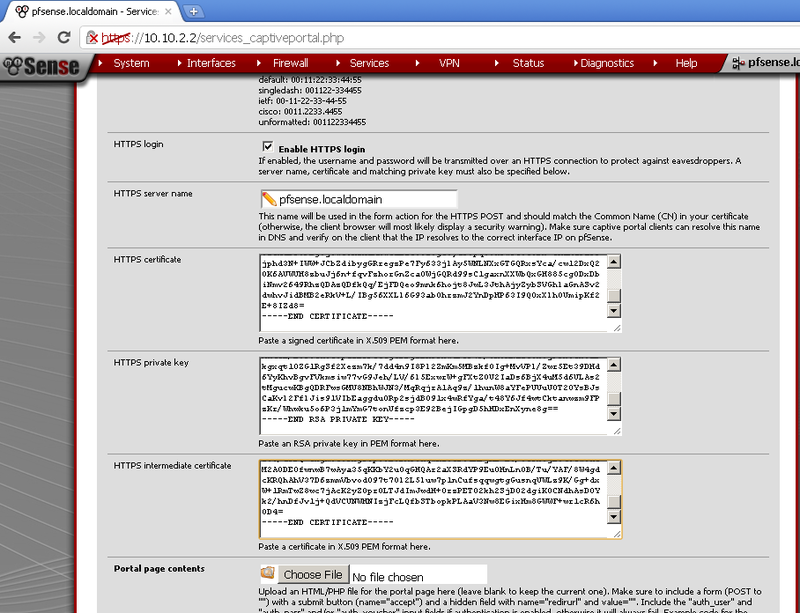 The contents of the HTML/PHP file that you upload here are displayed when an authentication error occurs. You may include “$PORTAL_MESSAGE$”, which will be replaced by the error or reply messages from the RADIUS server, if any. Connect to the guest network and try to open a web page. You will see a warning about your certificate, go over it. Now you are supposed to see your new custom page. Enter your username and password, look at the Acceptable Use Policy and Click on the Accept check box. Then on the Continue button. If you don’t tick the Accept check box a warning message windows will appear, that will inform you that you must accept the policy first. In case that you intentionally or not mistype your user name and/or password, you will see in red Invalid credentials specified. Now you can try to enter then again. After successful log in you will have internet access, and on the Status > Captive portal page you will be able to see the currently logged on users. DNS record surprise me because I have not used it up until now. Now we have better looking pages displayed to our guest, and well communicated Acceptable Use Policy of the Guest Network. The credentials of our users are transferred using SSL cannel and are not in plain text. Good news, today RC3 was released, is supposed to be the last RC before RTM which is very promising. If the news are right we are waiting for RTM in a month, I hope that this is a realistic estimation for the time needed. Downloads are available, I’m in process of upgrading my lab from RC1 to RC3. For that purpose I will user clean install and restore a configuration backup. Upgrading is not of my preference, but will eventually try it later on. More or less it is expected from a company to provide some form of Wireless Internet Access to guest, clients and partner visiting their premises. Providing them with such could pose a security risk if you use just a simple wireless access point directly connected to your LAN. It is better to isolate them in separate network segment without access to your LAN. 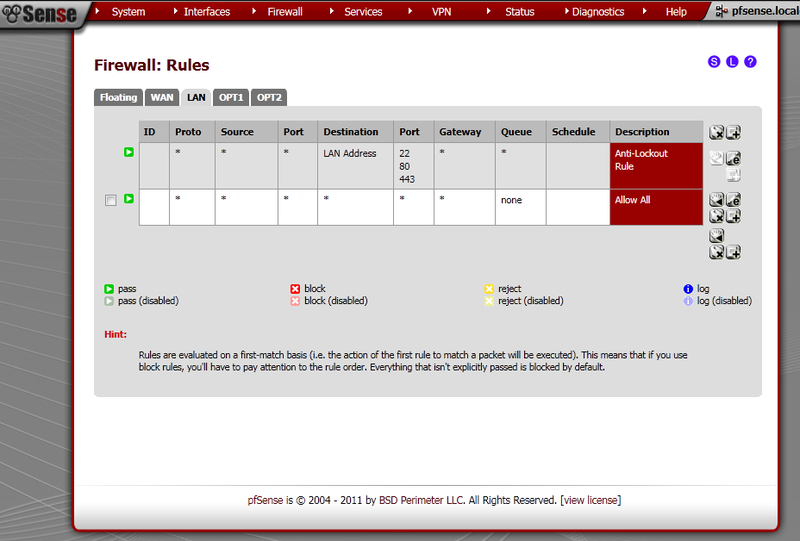 For that purpose we will use an Optional Interface and the Captive Portal feature of pfSense 2.0 RC1. You want to provide your guest with Internet Access using single of multiple Wireless Access Point, but you want to prevent them from lurking around your servers and workstations. Even worse they can be infected with some malicious code that could try to take over your network. You have probably seen what enterprise grade wireless solutions offer as functionality, but the price of these solutions is prohibitive to implement for Small Office Home Office (SoHo) uses. 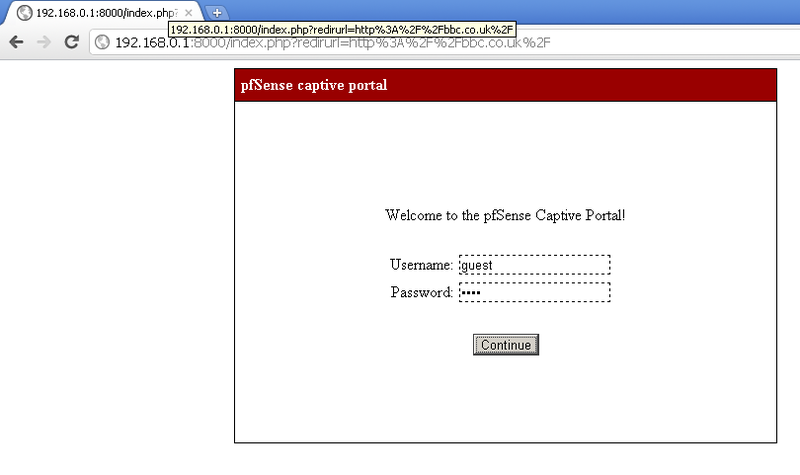 In this post we will look at the basic configuration of Captive Portal, a feature of pfSense, and how to implement a basic scenario with required authentication of guests, which will be quarantined from our internal network, but will have almost full Internet Access at their disposal. 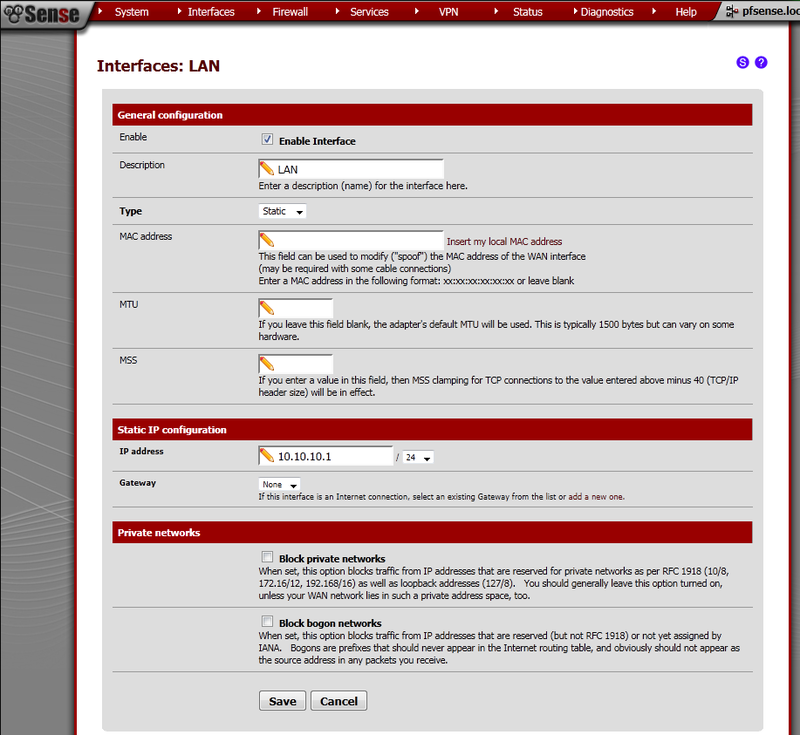 We have a simple setup of pfSense 2.0 RC1 with three network interfaces. The WAN gives us access to the Internet, behind the LAN interface resides our servers and workstations, and we will put the guests behind the GUESTS interface. For reference take a look at the network diagram. Some hardware appliance on which pfSense is running might have Wireless Network Interface Cards installed initially, in that case you can use that interface for GUESTS, but currently I do not have such card available for testing. At near future when I do get one, I will test this scenario too. If you are unfortunate enough to have only two network interfaces, but you are fortunate to have a VLAN capable switch you can separate the LAN and the GUESTS into separate VLANs. Take a look at the network diagram below for reference. Yet again this is a separate scenario that I will leave for the future posts. If you haven’t configured the third network interface already, let’s configure it now. Go to Interface > (assign), and click on the + button, and then click on Save button to save the configuration. Not go to you newly added interface, the name by default is OPT1. Tick the Enable Interface and click Save. Now you can enter a Description for this interface, in my example I used Guests. 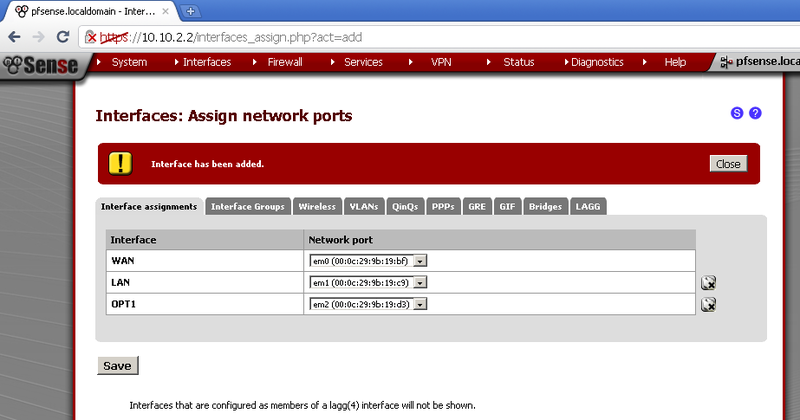 In the Static IP configuration section, enter IP Address for the interface and a subnet mask. In my case these are 192.168.0.1/24. Then click on the Save button, and Apply changes. on the Guests leaf, tick the Enable DHCP server on Guests Interface. Enter a Range aka Pool of IP addresses available for our guests, in my case 192.168.0.10-20. 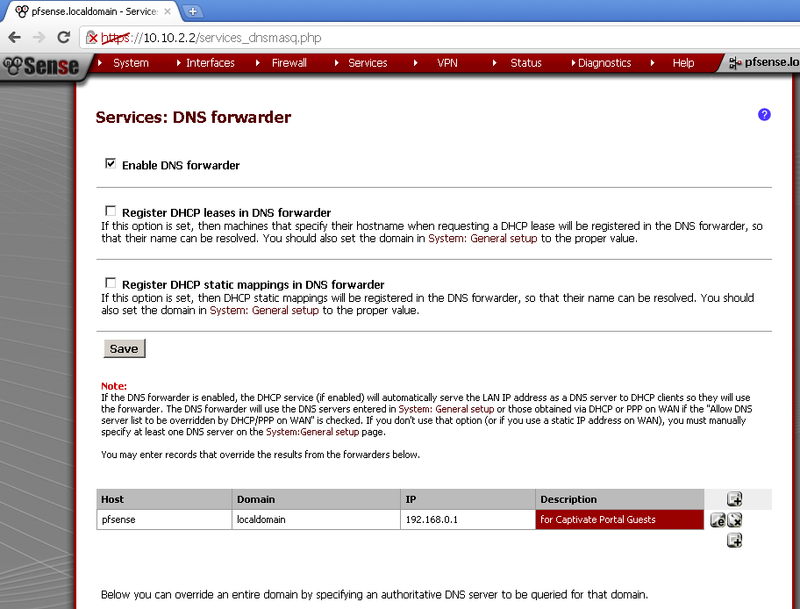 Enter 192.168.0.1 as value for DNS Server and a Gateway, then Save the configuration. 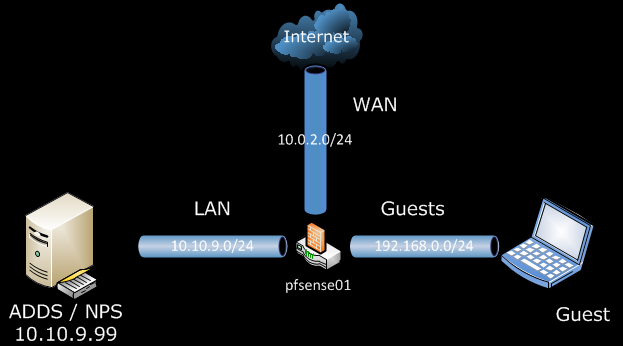 As we stated in the Scenario section, we want to provide our guests only with Internet access, and NO access to our LAN resources, also preventing them from accessing the Web GUI of the pfSense is a good idea. As you know pfSense is a fork of m0n0wall, so the rules still apply. The NetBIOS Block rules do exactly that the description states. 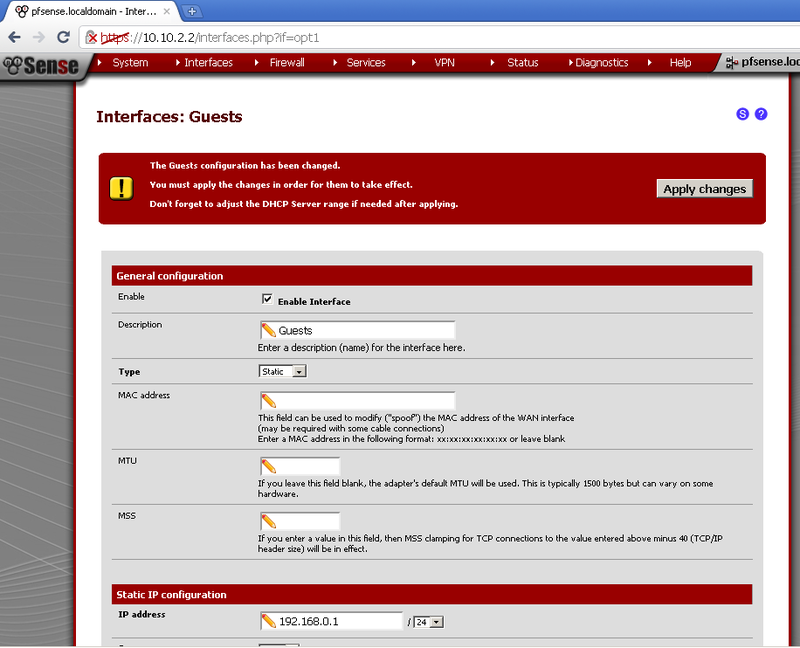 Web GUI Block prevent guest from accessing the management interface of the pfSense from the wireless network. The WAN Address / Subnet Block, prevent the guest from accessing any devices connected directly on our WAN port in case you have something like modem or anything else that could be configured using web or other interface. The last Guests to Any Other Than LAN network provide our guest with the so much needed Internet Access. If you’re providing Wifi access you certainly don’t want to worry about some jackass out in the parking lot in the middle of the night trying to hack on your portal. Go to Services > Captive Portal. 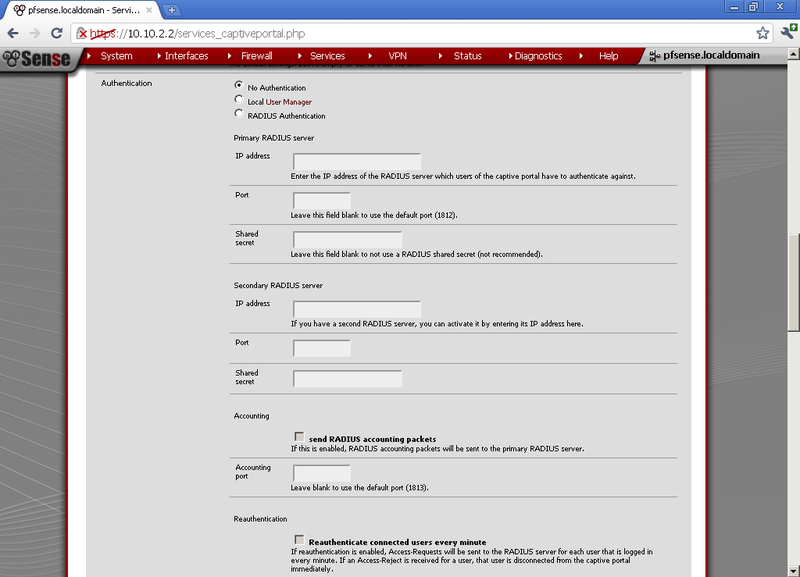 Tick the Enable captive portal, and select our Guests Interface. You can leave to the defaults values for now Maximum concurrent connection, Idle timeout. For Hard timeout you can choose a period depending on the average stay of your guests, for my test purposes a value of 60 minutes is fine. If you really believe that you guest a conscience enough you can enable the Logout popup window, and give then the possibility to logout by themselves, but for the sake of simplicity I will not enable this feature. Very nice feature is the Per-user bandwidth restriction, you can limit the amount of bandwidth that each user can consume. This will slow down their access but will provide resources for more concurrent users. It is up to you to decide whether to use this or not. In my setup, I’ve enabled this feature for testing purposes, and the results were satisfactory. For Authentication, we have three options, No authentication can be used for a page with Acceptable Use Policy for the Wireless Network, which your guest must only acknowledge. For this example I will use Local User Manager. In a future blog post I will take a look at RADIUS Authentication. For now scroll down to the end of the page and click Save. 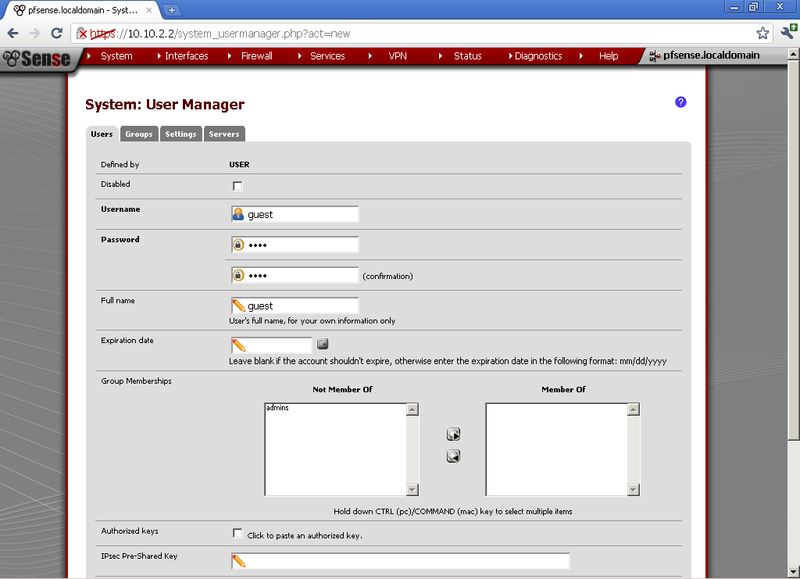 Go to System > User Manager and create new user. For my example User name is guest, type in a Password, and Full name. The purpose of the Captive Portal is to force guest users to visit a page before they are provided with Internet Access, whether you will simply require them to accept a use policy, or to authenticate in some manner it is up to you and your needs. Now I suppose that you have connected one or more Wireless Access Points to the Guests Interface of the pfSense, and configured a SSID for guests. After that you have connected to this Wireless Network. Now when you open a browser and type in some website address, you will be redirected to the Captive Portal page and be required to enter user name and password, use the guest account. After successful authentication you will be redirected back to the original web site address that you have entered. Now you can connect one or more Wireless Access Point to the Guest interface of pfSense and distributed the guest user name and password to clients coming over. Whether you will limit the services on to normal business hours, or limit the bandwidth for each user I leave up to you. 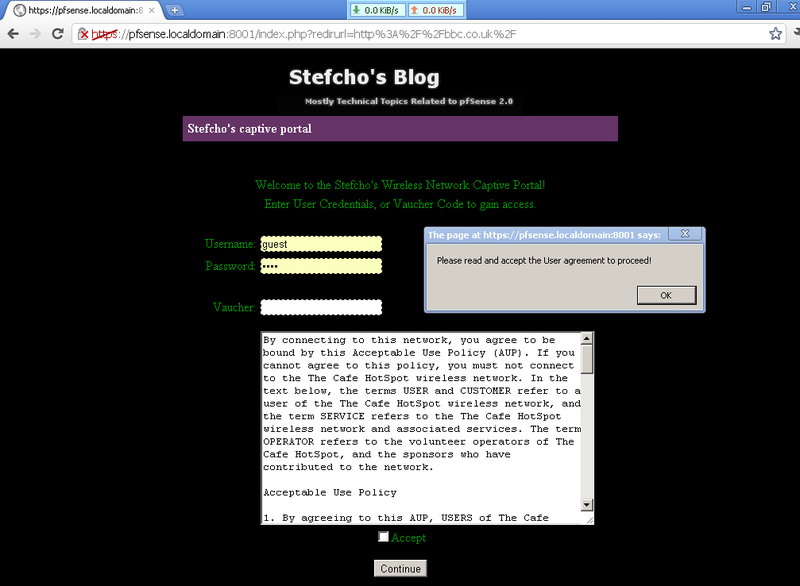 In the following post I will look at the possibilities to customize the Captive Portal pages, and implementation of Vouchers and RADIUS authentication. After we looked at the different options for Road Warrior and Site to Site configuration for OpenVPN on pfSense 2.0 RC1, now it is time to combine them in one solution. You have one or more Site to Site VPNs already and at least one Road Warrior setup for your users. Initially you are happy that you users can consume services from the site that hosts the Road Warrior, but then you want to give them access through the same connection to other sites connected to your main one. Take a look at the network diagram. 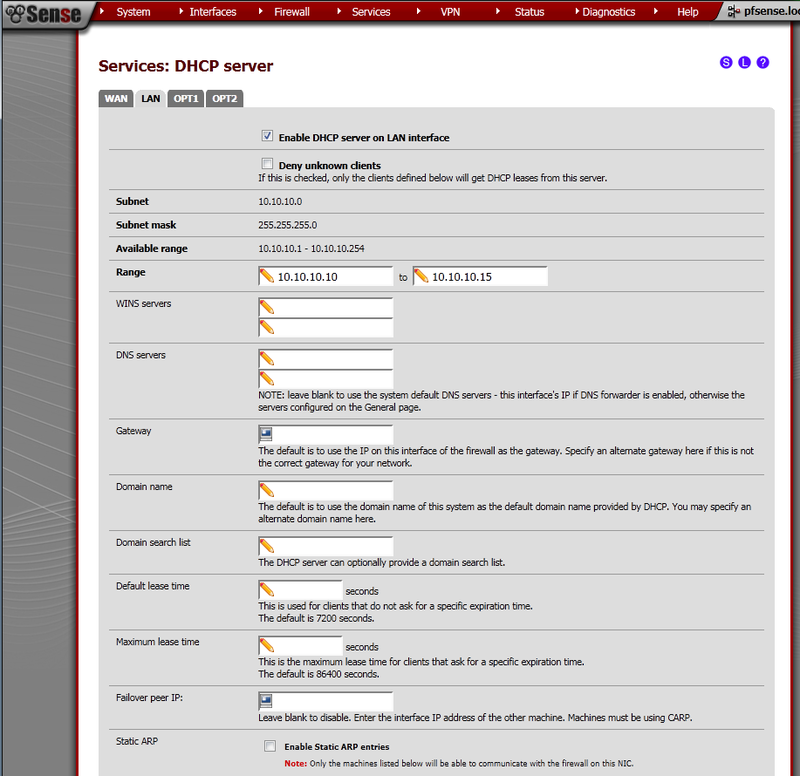 pfSense01 serves the main site, and provides access to the remote users, but also has a site to site configuration with pfSense02. 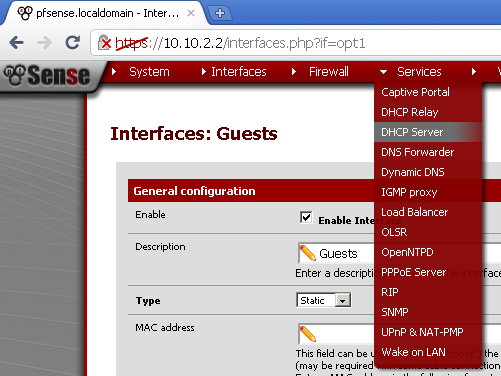 If you are on the LAN (10.10.9.0/24) side behind pfSense01, you will be able to access machines through the Site to Site connection and communicate with machines on the other end, for example 10.10.10.99. But if you are the VPN Client, you will be able to only access machines in the 10.10.9.0/24 network. 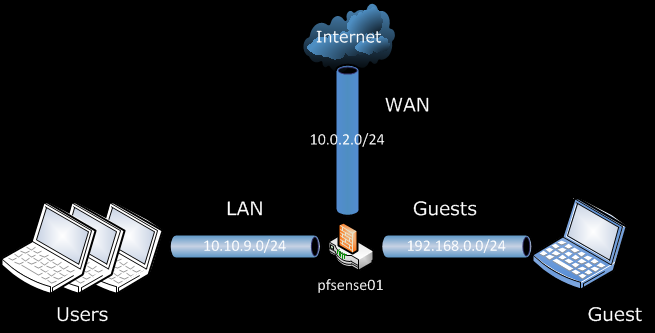 Our aim is to provide the VPN Client access to network behind pfSense02 (10.10.10.0/24) in addition to the 10.10.9.0/24 one. If you have already configured Road Warrior and Site To Site configuration skip to the Advanced Configuration section below. 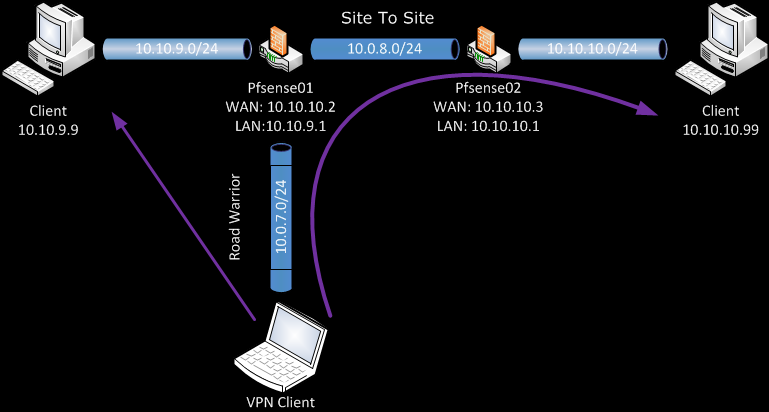 The push “route 10.10.10.0 255.255.255.0”; on the Road Warrior configuration tells the client that they can reach machines on the second site via the OpenVPN connection. While establishing connation OpenVPN Client adds an additional route to the second site. The route 10.123.45.0 255.255.255.0; will instruct the second site how to answer on requests from the OpenVPN Client. After you save the configuration changes, connect to the Road Warrior, and test you connectivity to machine on both sites. While I was configuring similar setup, the routing part was new to me and I found it difficult to grasp at the time, but thanks to jimp’s help on the matter everything is crystal clear. 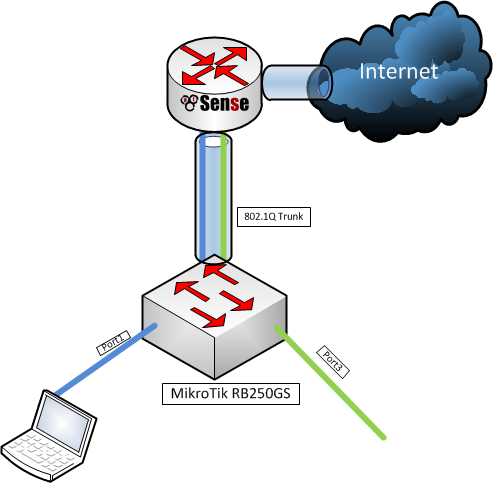 This article gave me the idea to use pfSense as a router and trunk a few VLANs. My aim is to reproduce the configuration from the above mentioned post with three VLANs, trunked on a single LAN interface (aka Parent interface) to the pfSense. To make it more usable, every VLAN will be on separate port on the switch (aka Access Port) and have its own instance of DHCP running on the pfSense. In this way, when a client connect to some of the ports he/she will automatically receive configuration contextual to VLAN on this port. The difference here is that the LAN virtual NIC is bridged to the second physical NIC of my workstation and from there directly connected to the RB250G switch. We start with installed pfSense 2.0 RC1, configure WAN port bridged to my first physical NIC, and LAN port connected to my second physical NIC. For the sake of convenience and because of the problems that I faced initially with the communication on my second NIC, I decide to manage the router through the WAN interface, because its configuration will not change during testing. 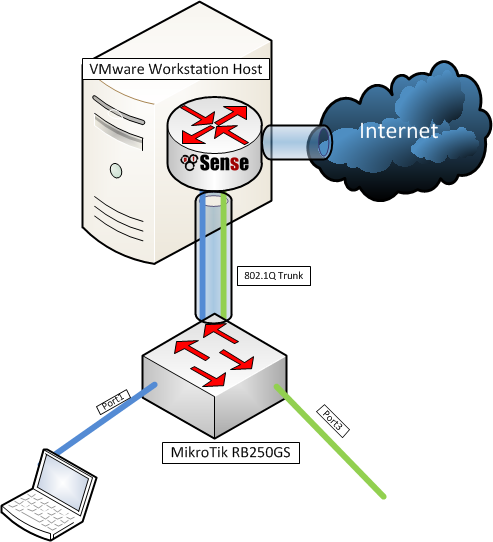 More on the topic VMware Workstation Virtual Machine and VLANs support, you can find at the bottom of this post. 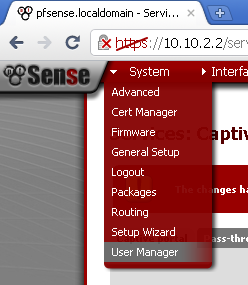 There are two ways to configure VLANs in pfSense as long as I’m aware. One is through the console and the other is using the Web GUI. Here I will use the latter. 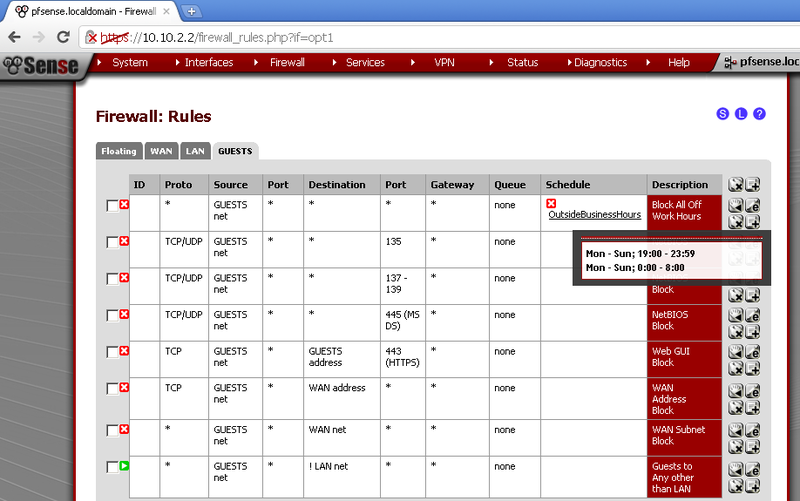 First let’s configure Rules on the WAN port to allow access to the Web GUI. 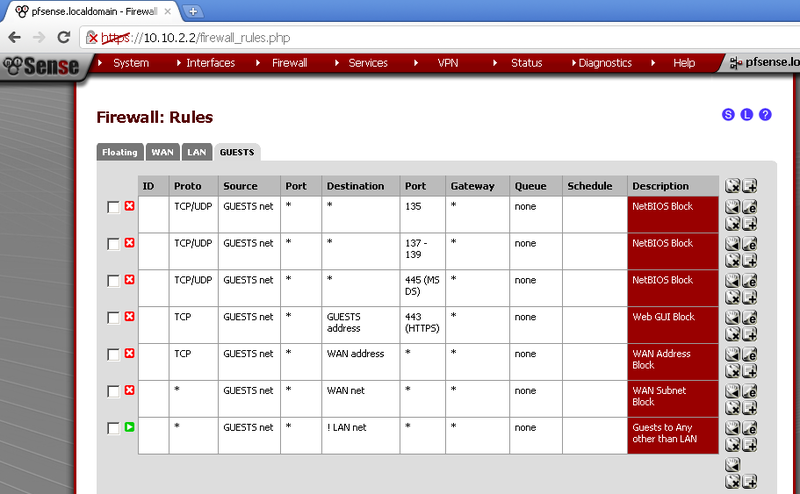 Got to Firewall > Rules, on the WAN leaf, add new rule. The Interface is WAN, Protocol is TCP. Destination port range is HTTPS, enter and description. 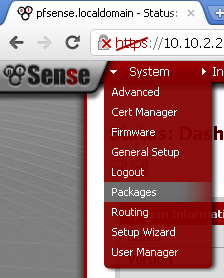 This will allow access to the pfSense WebGUI on the WAN IP Address. Make sure that you second Network port is not assigned to any Interface, if it is removed it. In my case this is em1. This machine has two interface em0 for the WAN, and em1 for the LAN. 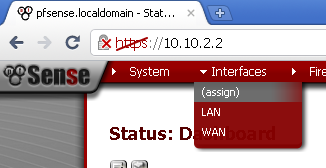 Go to the VLANs leaf, click on the add button. On the new page make sure that Parent interface is em1. Enter VLAN tag number different from 1. I’ve made three VLANs – 100, 200, 300. Now we need to assign these as Interfaces, go to Interface assignments and then add them one by one, select the proper Network port which are the VLANs that we have just created, and do not assign em1 to any Interface directly. 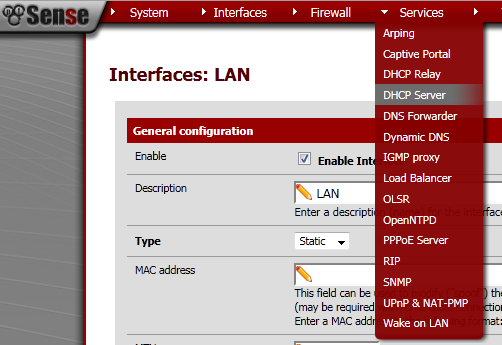 Now select LAN interface from the drop down menu under Interfaces. Tick Enable Interface, as type select Static. Under Static IP configuration, enter IP address and subnet mask. In my case it is 10.10.10.1/24. For the sake of simplicity every interface will be allowed communication to everywhere. Go to Firewall > Rules, on the LAN leaf. Action is Pass, Interface is LAN, Protocol in Any, Source is Any, Destination is Any, enter some Description too. Repeat this step on OPT1 and OPT2 leafs too. Go to Services > DHCP Server page. 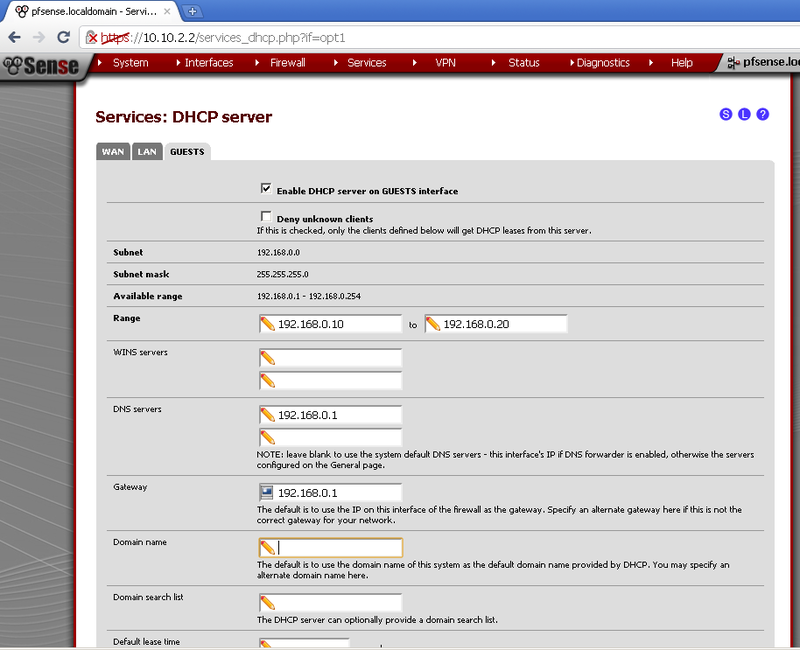 On the LAN leaf, tick Enable DHCP server on LAN interface. Repeat the procedure for the OPT1 and OPT2 leafs. In my case the ranges were. Before configuring VLANs on the switch, make sure that your firmware version is 1.2 or higher, by the time of writing this version 1.5 of the firmware is available. Otherwise you may run into problems that are related to applied functionality of the device. On the Switch, go to the VLANs leaf, add the same VLANs from the router. As for ports member always add Port1 and choose one of the other ports. This is the tricky part, my pfSense router is connected to Port1, which makes it Trunk port and must be a member of all VLANs. For Port 1, our Trunk Port – VLAN Mode is Enabled, default VLAN ID is 1 and VLAN Header is Add If Missing. For the other Access Ports the configuration is as follows: VLAN Mode is Strict, Default VLAN ID is configured by your design, from the VLANs configured on the router. 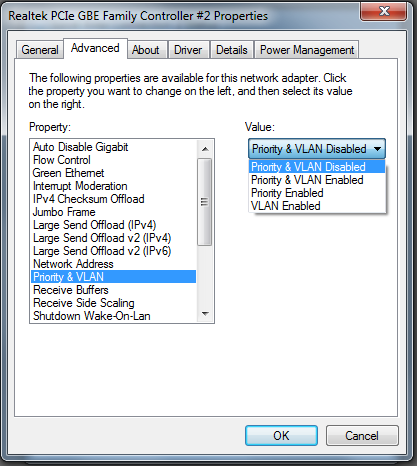 You can leave Force VLAN ID unpicked, VLAN Header is Always Strip. Now if you plug the test laptop to one of the Ports 3,4,5. And the NIC is configured to receive configuration from a DHCP server, you will get IP address from the subnet of the configured VLAN range. Because of the Allow All traffic rule you will have Internet, and access to host on the other VLANs. Some issues that I faced along the way. My idea was to configure quickly one VM with pfSense, and use the bridged interface for connection to the switch. Everything works fine up until I configured VLANs. Then suddenly the communication between the route and switch stops. After a little network sniffing what surprised me, was that the packets were not tagged with VLANs. After extensive googling on the topic, I did not found definitive reason for this strange behaviour. One part of the information was related to the physical NIC support of VLANs. The other portion of the topics were about the VMware VM and the type of the virtual NIC configured on the virtual machine. Unfortunately my EVGA X58 motherboard is equipped with two on-board Realtek NICS, but fortunately enough they support VLAN and event Priority. When I check the configuration of the bridged NIC Priority & VLAN were Enabled. The troubleshooting took me long hours, but finally I’ve got a great idea. What if I turn off the Priority & VLAN support on the physical NIC? 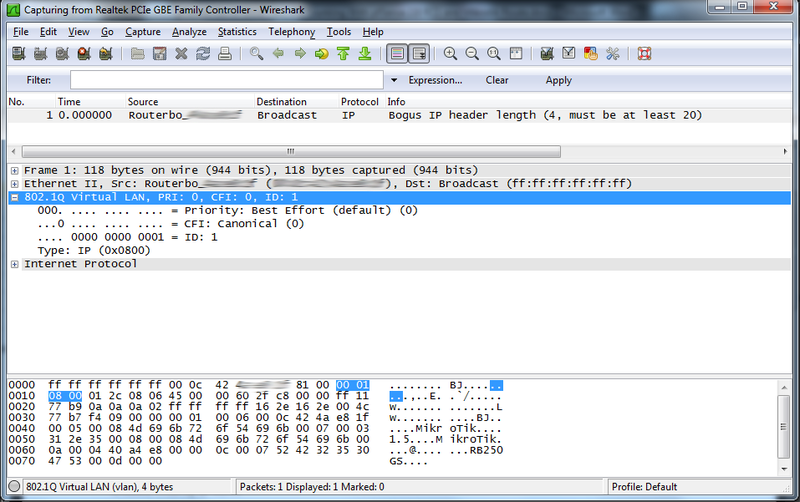 And indeed, packets start showing with the 802.1Q Tags. My suspicion is that the physical NIC strips off the VLAN tag, and this is the cause of the disruption in communication between my router and switch. If you ping the switch the pings are around 17-9 ms, which is huge taking in to account the device is directly connected.